Howlin' Wolf Records: SIX STRINGS: GORILLA INTERRUPTED is a different kind of good! Let me just start off by stating that I am a huge fan the guys over at RedletterMedia.com. I love their review shows HALF IN THE BAG, BEST OF THE WORST and the extremely insightful/hilarious PLINKETT REVIEWS. The shows' creators Mike Stoklasa, Jay Bauman, and Rich Evans are three talented and funny individuals that bring something a little different to the Internet with their web series. They have a bunch of short films on their website and occasionally put out a movie now and then. I highly recommend FEEDING FRENZY. 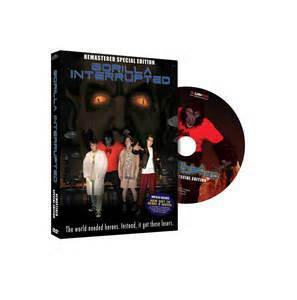 They have been gracious enough to release their first movie they made back in the day called GORILLA INTERRUPTED. Those guys are pure genius. When I heard they were expanding past the Mr. Plinkett videos I thought it would never work, but they built a strong brand. I try to help them out whenever I can. Thanks for the comments!